Generator owners can find it reassuring to know they’ll have backup power in case of an outage during a storm. They can use their portable generators to power essential equipment such as portable heating units, computers, water pumps, freezers, refrigerators and lighting. If you are using a portable generator for temporary power, you have to use caution and take the necessary safety measures. Portable generators can be dangerous if used improperly, which can lead to injury. Never use a generator inside your home, garage, crawl space or other enclosed areas. Only use your generator outdoors, away from open windows, vents or doors. Use a battery-powered carbon monoxide detector in the area you are running a generator. Use caution when touching your generator. Many areas become hot and can burn you. Never leave your generator running when you are away from your home. Generators produce powerful voltage, so never operate under wet conditions. Take precautions to protect your generator from exposure to rain and snow. 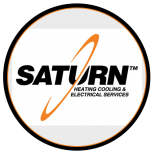 For more than 20 years, Saturn Heating Cooling & Electrical is your top-rated local expert for complete turnkey installations and reliable service of Generac generators. Your safety is our top priority. Contact us today for more information on how you can protect your home and family without any worry of power interruptions.